The Mystery Man from The Magic Band. Yes, indeed, here’s something to look forward to. Due to be published around 8 June Beefheart’s co-songwriter, Herb Bermann tells his story about the songs and how they came to be written. It also includes an introduction from John French and an interview with Herb conducted by the Radar Station’s former newshound Derek Laskie. Available from the publisher and I have been told that they will only be selling one copy per person. Yet Bermann kept silent about Captain Beefheart for almost 50 years—so silent that some people said that Captain Beefheart had invented him. Now Bermann shares his story! Fans will be charmed by Bermann’s descriptions of how his songs came to be written. They may also be surprised to learn just which songs he says he wrote. Included is a facsimile reproduction of his original lyric sheets, with dozens more songs that were never produced. 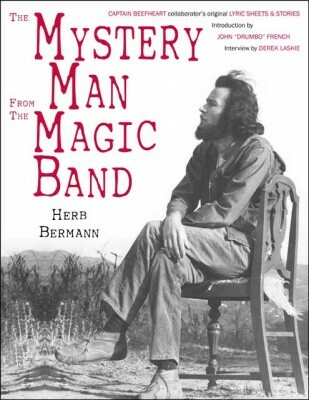 Bermann’s story reveals previously unpublished information about the early work of Captain Beefheart and His Magic Band, Neil Young and Steven Spielberg. It also introduces us to an artist whose work and influence have been generally overlooked.